Hello LSS fans!! This is Debbie posting a special project today! Wendy Landis...the owner of Leaky Shed Studio is playing along with the Design Team today!! 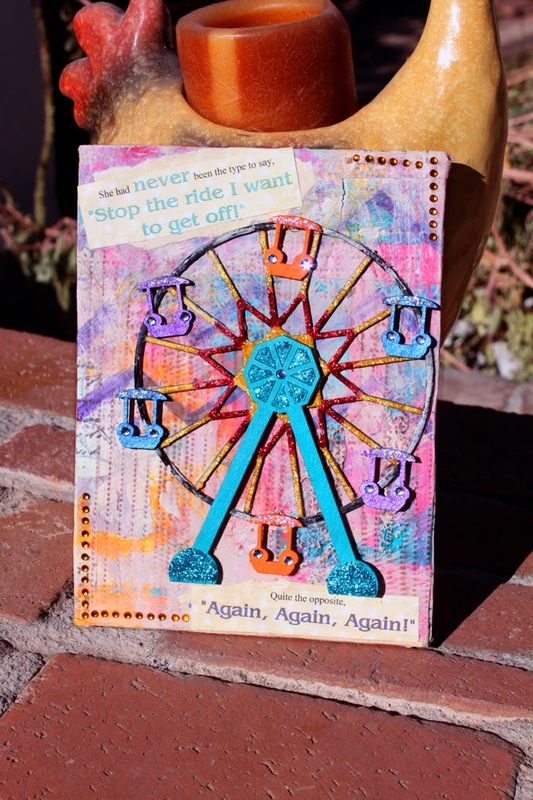 She has created this fun, sparkly and colorful project to share with all of you! She used the Leaky Shed Studio Ferris Wheel Chipboard on this project. You're going to love it! Doesn't this wording fit perfectly on this project!! Don't you love all the fun colors she chose on the little buckets? The spokes are so glittery and fun too! Thanks Wendy for playing along with the Leaky Shed Studio Designers!!! Don't forget to check out our Facebook page and our Pinterest page for more great inspiration from the Leaky Shed Studio!! Thanks for stopping by the Leaky Shed Studio Blog!! This is just gorgeous! I love love love that Ferris Wheel!!!! Now that's a Ferris Wheel I can get close too!!! Great colors.. and definitely love the saying.